I just got back from Cali last weekend. And like a true dodo head, I left my camera there. I hadn’t been feeling all that well for the duration of the trip. I guess it took a toll on my brain in addition to my body. Luckily, I have a loving mom, who immediately shipped the camera to me along with a care package. I will have to post the pics of the package at a later time. 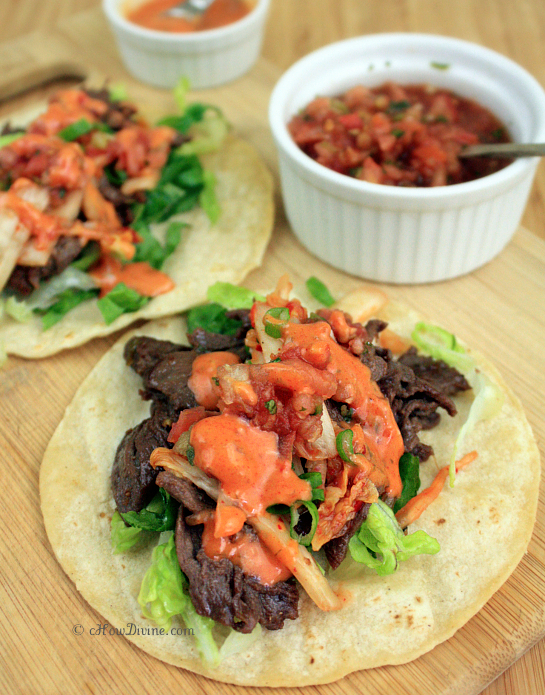 But here is a post of the first batch of the photos I uploaded from my just-received camera: Korean-Style Beef Tacos. It’s apropos since I made a variation of these tacos for my mom while I was in Cali. I think it was one of her favorite dishes that I made while in Cali, if not THE favorite. This is made with bulgogi (and I have posted a version of this in the past), but you can also make it with leftover Galbi-jjim (Korean braised short ribs). So so delicious either way. As with most recipes on this site, you can personalize it to your liking or food sensitivities. I made mine completely dairy-free, but had shredded cheese and sour cream on hand for those who wanted those toppings. Additionally, I served some regular (gochujang-free) sour cream for those who wanted the dish gluten-free. This dish is so easy to make. Don’t let the ingredients intimidate you. Even my mom was so surprised by the simplicity in the preparation of this dish. You should really give this a try. Place the beef in the freezer for about an hour or until it is partially frozen. Once it is partially frozen, slice the beef as thinly as possible against the grain. Place the sliced beef in a large bowl or a ziploc for easy cleanup. Heat a grill pan or a skillet on moderately-high heat. Add canola oil to coat the pan/skillet. Add marinated beef to the pan/skillet and stir until cooked through. Don’t overcrowd the pan/skillet. Do it in batches if necessary. Overcrowding will result in lowering of the temperature of the cooking surface; this will result in boiling or steaming of the meat. On moderately high heat, it should take about 3 minutes for the beef to cook through. Serve the bulgogi in the warmed corn tortillas with kimchi, shredded lettuce, and any other topping of your choice. I learned this method of heating corn tortillas from Serious Eats. It’s a bit more time-consuming then other methods, but it’s really worth it. If you don’t have the time or the energy, you can always heat them in a damp towel in the microwave! Gochujang usually has gluten in it. OMIT it, if you want your tacos to be gluten-free. Additionally read the labels of all ingredients carefully as manufacturers’ practices vary. Oh my Ms’ Chow – this looks very very yummy! I’ll see if my ladies are up for this. What a wonderful fusion idea! Some cuisines seem to be made to mix and I think that Mexican tacos and Korean beef and seasonings sound like perfect company. They would be perfect for tonight’s calm wine evening at home… Too late to go shopping though. I am glad that your mom took care of you, while you were there…busy life can bring much stress, but It’s good to have you back to blogging. I’ve never tried mixing sour cream & gochujang, though–sounds so good! This reminds me of Korean fusion food truck, gonna try it over the weekend! Have a lovely Friday! It was so great having my mom close by. I didn’t realize how nice it was until I moved away. But yes, it’s also nice to be back home and getting back into things. I’m the same way with kimchi and gochujang. I think my body actually craves it if I don’t have it for a few days! You should try mixing gochujang with sour cream or just eating kimchi with some sour cream. I think it’s the heat from the gochujang and the cooling effect of the sour cream that just complement each other so well. Or it just may be me! 😀 Thanks Sandra! Have a great weekend! Hi gomo! Are you an OG socali gal btw? I swear, I think almost every Korean has made their own Korean tacos before the food truck (aka Kogi) revolution. Other than having become overrated and overly commercialized, Korean fusion tacos is nothing new to us Koreans, right? lol..been making them at home for years. I remember when I was a kid, my mom put Kimchi in tacos. And I thought it was the weirdest thing. But it didn’t taste bad. But I didn’t have that combo again until years later when the food truck revolution started happening. I tell my husband that very thing all the time, that I’ve been making Korean-Mexican fusion since I started cooking! There is just natural harmony there. The food truck craze has popularized it, but by no means, did they originate it. But as my hubs always says, “hey, first to market usually wins!” 😛 Hope you’re well Miss Kim. Have fun over the weekend! I tried it yesterday and it was match made in heaven…Although instead of the corn tortillas I used thin Pita bread and Lettuce leafs, either way it was yummy. Thank for the recipe…Happy Sunday! Pita bread sounds good to me! It doesn’t matter what you wrap it in as long as it holds all the yumminess together. 🙂 I’m so glad you like it. Thanks for letting me know. Happy Sunday to you too Sandra! Homemade Korean style tacos like this are always so good! Agreed! It’s one of my favorite easy go-to dishes. Thanks Kevin! Welcome back! 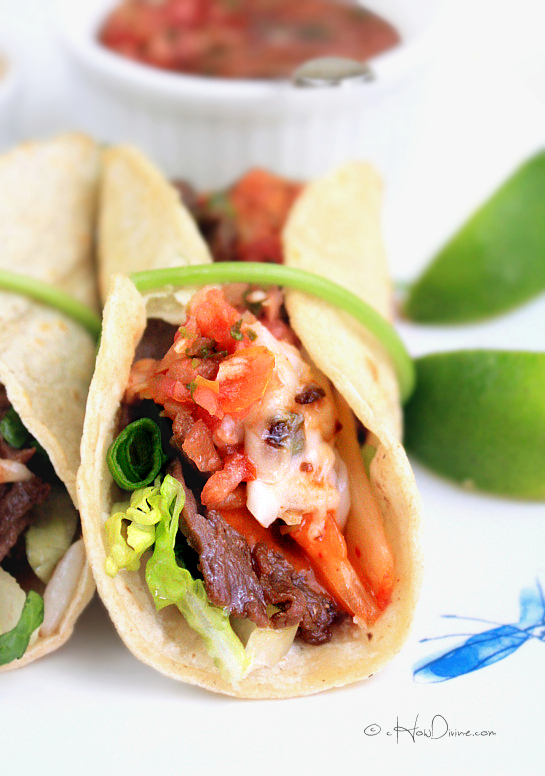 Great looking tacos – tons of flavor, and as you say, quite easy to make. I’ve read about that method of heating tortillas, and really need to try it some day. Being lazy, I usually use the microwave method. 😉 Anyway, good stuff – thanks so much. Thanks John! I’m still trying to get back into the groove of things. I must admit it’s been a little difficult after a few weeks of complete laziness. These do have a ton of flavor. And I totally get you; I often just throw the tortillas in the oven too. Hope you had a great weekend! I love, love, love these tacos! Brilliant idea to use Kimchi! I’ve got to try these. Glad that you had a nice visit with your mom even though she was bringing you back to health during the visit. Understandable that you forgot your camera. Glad you’re home and hope you’re feeling better! Thank you MJ! It was a wonderful trip despite my ailment. I’m glad to be back and getting back in the swing of things again. And I really hope you try these. There’s little wonder why Korean tacos became so popular. These are so good! Hope you are having a great start to the week! Love love Korean Mexican fusion! I think it fits the Korean palate so perfectly. I hope you try it. Thanks Sue! My mouth is watering! it looks awesome! Thank you! 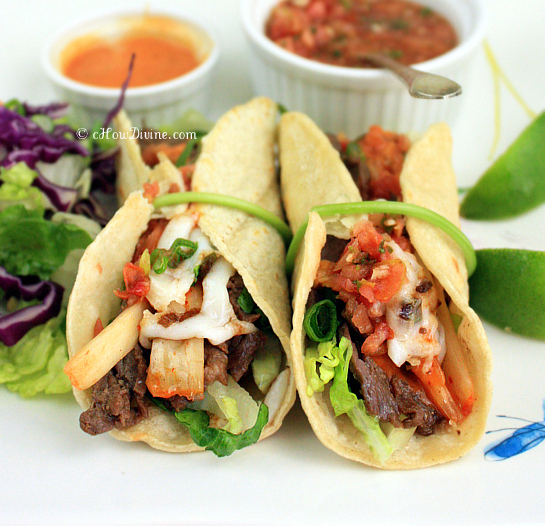 Korean and Mexican cuisine make a great flavor combo! Hi, what sauce did you put on top of salad on the taco? Hi Melanie~ I usually use pico de gallo (fresh salsa) I buy from our local grocer, but you can make your own. And the tacos in the photos also have some gochujang sour cream (1/4 cup sour cream + 1 TB gochujang) and melted cheese on it. I hope that helps!